Good morning from Cody’s Dad. Magic is getting into a rhythm…he is going poop on every walk. And this morning’s walk resulted in his first solid poop. Cody then enters the bedroom and I assist him up on the bed. He takes one glance at Magic and moves directly to his favorite spot on HIS side of the bed. Magic moves over to Cody, begins sniffing his face, Cody shows his teeth and Magic returns to his original spot near me at the headboard. Lights out from 9:30 pm to 6:30 am. Not a peep from either BC. This morning after breakfast and two walks, Magic suddenly transforms into a whirling dervish…tossing squeaky toys in the air, throwing toys on the love seat, bouncing up on the love seat, throwing toys around, running around BACKWARDS, and squeaking every squeaky toy he can find. Then, the Codeman wants to get involved…barking at me…barking at Magic, picking up squeaky toys. Yesterday, Magic was taken for a drive in the Scion up to Lake Zurich. No drooling, no throwing-up, no barking…a good boy. In Lake Zurich at Chris’s house, the Siamese cat took one look at Magic, ignited her afterburners, and LAUNCHED up the stairs in a flash. Magic was interested but listened VERY well to stay at the bottom of the stairs. …Tom and Cody’s bed is pretty comfy, too. 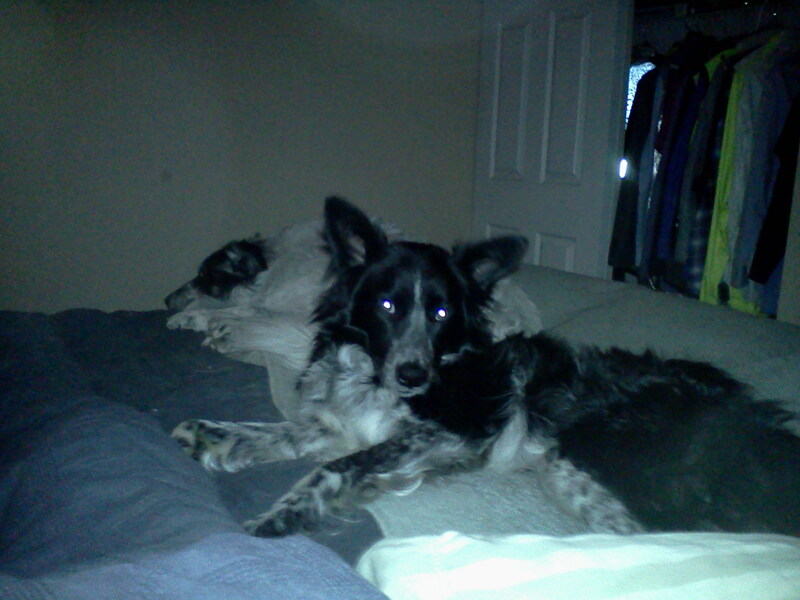 This entry was tagged border collie, border collie rescue, dog behavior, dog rescue, dogs, life with dogs. Bookmark the permalink. The “boys” look so sweet all curled up on “their bed”! …..and I’m sure that Willow (the Siamese from Lake Zurich) will find a way to make contact with Magic before too long! And I am going to enjoy watching this happen! Well, well, well. It seems like Cody and Magic are becoming fast friends. Big surprise – not. 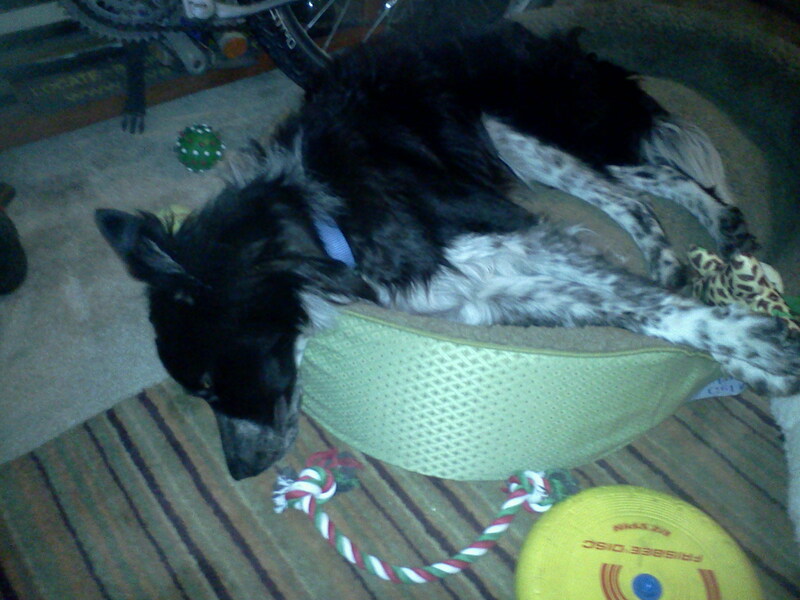 Cody’s Dad – might I suggest a A California king sized bed? ?